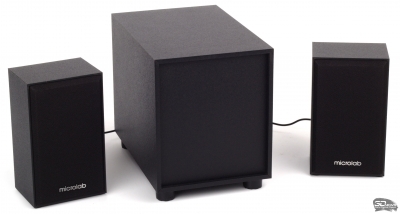 As a rule, three-way speakers standard 2.1 are large. Even when the speakers are satellites of such systems compact, the subwoofer is definitely heavy and I want to put it solely on gender. 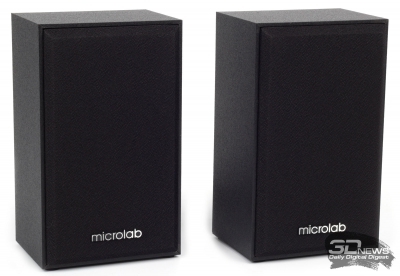 Most of the three-component models of the company Microlab Electronics fully comply with this unwritten standard, but one sound system is still the exception to the rule. It is a new device set Microlab M-105, which dramatically stands out from other models its unusually minimalist design and small dimensions. 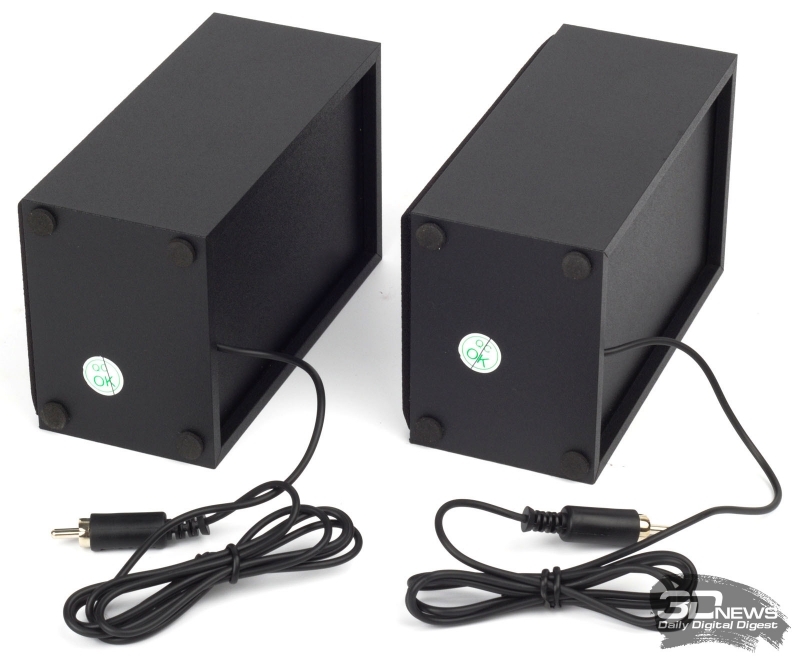 It is inexpensive, but, according to the manufacturer, high-quality acoustics, designed for desktop or shelf placement. It may well be suitable for replacement of computer stereo speakers, the sound of which long ago ceased to satisfy. But let’s not get ahead of ourselves, let’s start with an external examination. Phonics comes in a very compact cardboard box. If she didn’t have photos of the speakers, it is unlikely that even sophisticated users guessed about its contents – it is very easy. However, inside each other located and subwoofer and speakers. All neatly Packed in Styrofoam, so that problems during transport should arise. In addition to the subwoofer and two satellites, in the box we found only the audio cable jack-jack 3,5 mm to connect the system to the sound source and printed user manual in Russian. Interconnects have Microlab M-105 made non-removable and built-in speakers-satellites. Note that the remote control in this case is not provided. 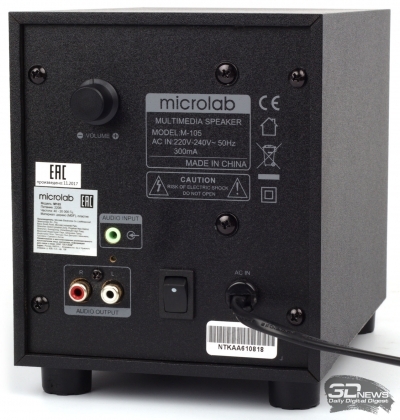 From most other 2.1 systems Microlab M-105 has a low stated capacity of sound. This, in fact, due to modest size and very very little weight set. But the amount of speakers you use can not be called very tiny. The subwoofer is used a four-inch bass speaker impedance of 8 Ohms — no other characteristics to it, unfortunately, not lead. Fail to know the exact features and columns they cannot be dismantled without damaging the housing. We only know that each column is equipped with one 2.5-inch speaker. The frequency range at the same time claimed simply huge: from 40 Hz to 20 kHz. However, even if this was true, the question still remains smooth frequency response throughout that range. No detailed characteristics of the developer does not. The novelty has only one input stereo channel, a signal which is fed through the 3.5 mm Jack. the Digital inputs is not provided, there is no additional analog inputs. All this suggests that the first model Microlab M-105 is focused on connecting to the computer. The amplifier and all the control unit components placed on the circuit Board of the subwoofer. There are fixed and the power Converter. As mentioned above, the kit claims to be the leader in the competition for the title of the most simple but elegant speaker system. It seems like the opinion here with nothing to hold onto, all three components of the system look free from any controls, and decorative items. But in fact, all sharp angles and regular shapes literally attract the sight, causing a passing man to pay attention to the Spartan simplicity of black parallelepipeds. 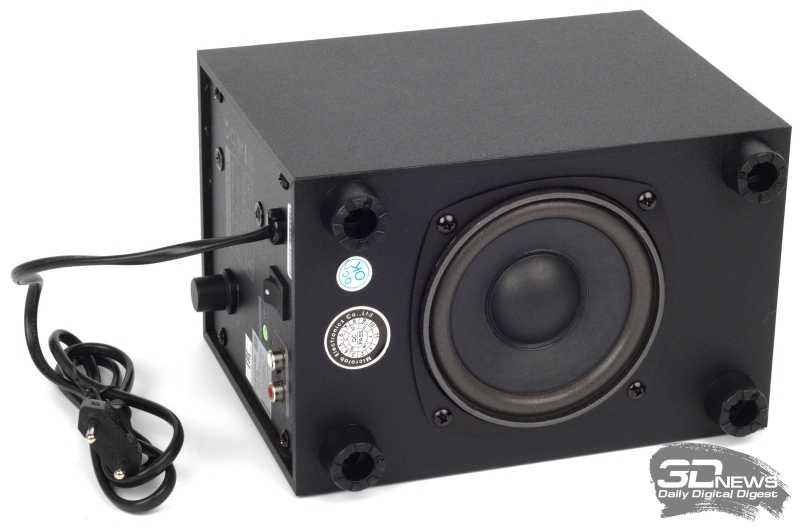 But in the absence of the speaker or the traditional mesh on the front panel of the subwoofer at all makes one question the purpose of this box. Note also the impeccable quality of manufacture of the kit. 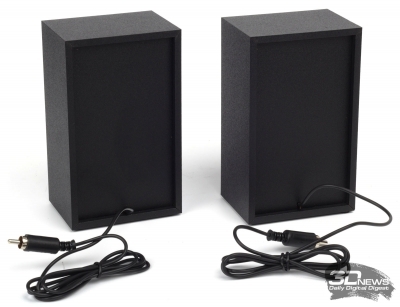 Speakers and subwoofer are made of MDF, though no detailed specifications of the material manufacturer does not. The outside of the body are covered with a film of black color with a pronounced roughness. With such good looks, this set will fit into any modern interior. In a far dark corner he might get lost, but on the table near the computer or on a shelf it will be pleasing to the eye. The length of interconnect cables, built-in speakers, not too big, but for a desktop model it does not matter — in different corners of the room these speakers still put not have to. Well, the connection problems should not occur even further from the audio person. 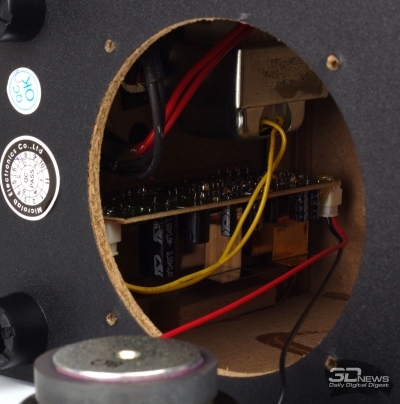 Speakers connected to the RCA jacks on the subwoofer, which, in turn, connects the cable with two connectors type mini-Jack to the sound source. Nothing complicated. 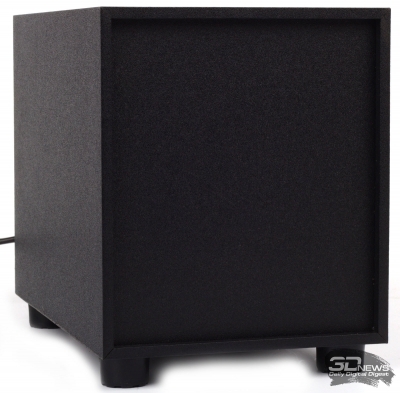 The subwoofer is arguably the most interesting component of the system. Even upon closer inspection here is quite difficult to find the main element of the speaker, or at least some kind of screen that covers it. Trumpet bass reflex on one of the smooth side panels is present, but the front side of the body is completely blank surface! It looks pretty strange, but everything falls into place once you turn the subwoofer. It turns out that the speaker is mounted on the bottom face of the case between a sufficiently high plastic feet which support the device. 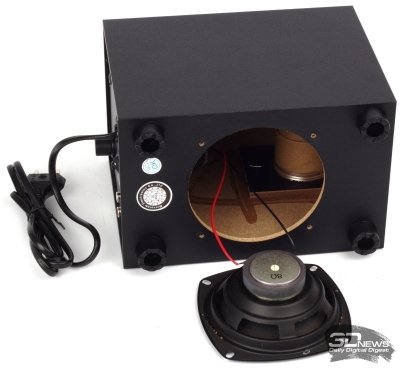 No mesh, no protective screen, the speaker is not closed, and therefore need extra caution in handling the subwoofer: can easily forget about the specific structure and grab the paper surface. However, this is the way a Hi-Fi subwoofer — and like a stream of complaints on their design has not yet been reported. All interfaces are traditionally located at the rear, removable panel, which is mounted inside the printed circuit Board. Free space here very much. In addition to the above-mentioned interfaces connect speakers and sound source, here is key off power switch and mechanical volume control. Level regulators low and high frequencies, the model Microlab M-105 is not, so all the appropriate settings (if required) in this case can be done only programmatically. 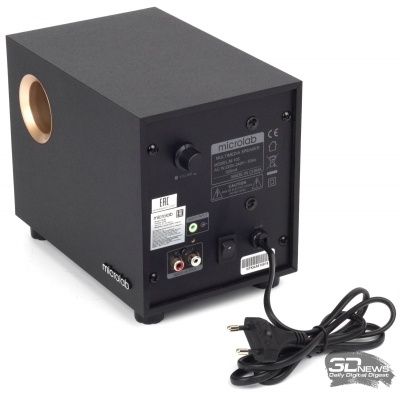 Note also that the power cord of the subwoofer is not removable. 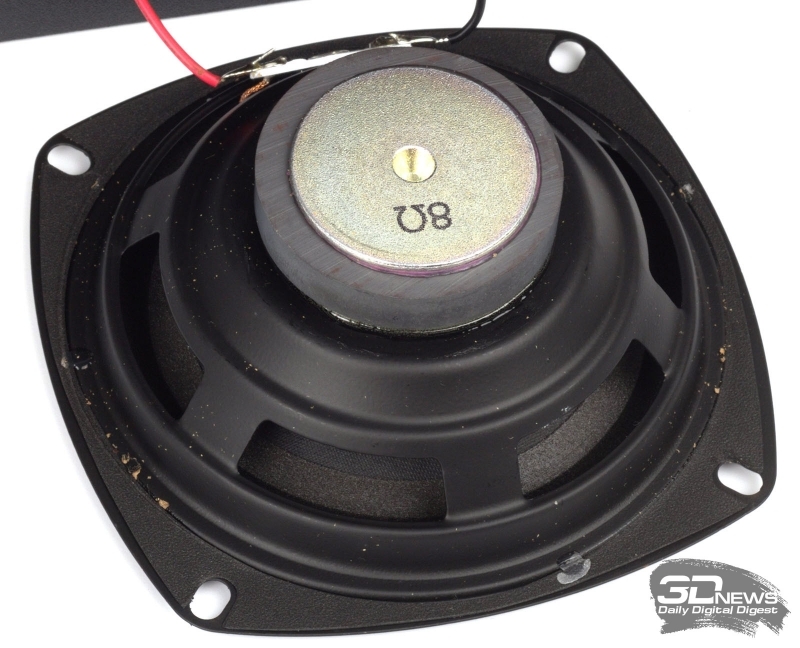 Speaker subwoofer, and rear part, easy to remove by unscrewing a few screws, which we did. Looking inside, we saw a smooth, well-machined edges of MDF Board. No burrs or other minor defects. All internal structures firmly in place. Most of them attached to the back panel, but for the flare of the port, an additional plate. 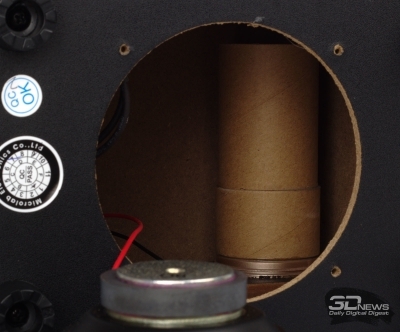 The overall quality of the performance of the internal parts of the subwoofer deserves respect. Speakers-satellites made in the same with the subwoofer design. They have the same hull in the form of direct parallelepipeds with edges and corners without a hint of rounding. The only difference is, speakers the speakers are located traditionally, that is, on the front sides. They are covered with decorative mesh with a single element of the decor throughout the set – a nameplate with manufacturer’s name. The mesh is made removable. To dismantle the speakers will not work, as all the elements of the case firmly glued to each other. Satellites rely on a small soft feet are glued to the base of the buildings. Note also that both speakers Microlab M-105 passive. The overall volume is only at the subwoofer. Overall, despite the minimalism both in design and in technical equipment, the acoustic system Microlab M-105 leaves after the external examination only the most pleasant experience. It is very simple and interesting. Another factor positively influencing the attitude towards the new product — very high quality workmanship. 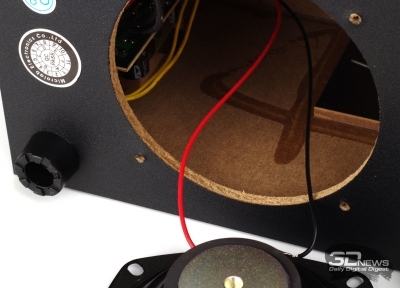 Neither the speakers nor the subwoofer does not even hint at any defects such as glue stains or inaccurate Assembly. All items are strictly adjusted to each other, which for a model this low price range can be attributed to important advantages. Those who value the ability to control the acoustics with the remote control, you will have to look to another model. Will not fit this kit and those who require several different interfaces for connection to speakers. Alas, the lack of both – that is something the manufacturer just saved. In the same piggy Bank is attributed to the lack of level controls low and high frequencies. There are no miracles. For the low price you have to pay something, and better it be a discomfort to manage than the quality of performance and sound. Moreover, second is not correct, and the first can be offset software adjustments. Assessing sound quality, we were without connection to external amplifiers. In this case, the sound source served as a computer sound card Creative SB Live! and tracks for playback used different formats and quality. 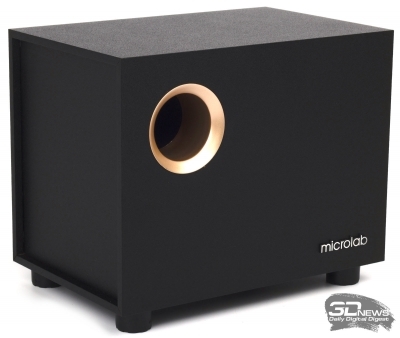 To appreciate the sound of music on columns Microlab M-105, we have listened to over fifty of the most diverse musical compositions of different genres and styles. In the beginning, to be honest, the mood we were quite skeptical, and the desire to compare the new product only analogs in this price range, but in the 2.0 format. This attitude was caused by values and parameters from the table of technical characteristics Microlab M-105. 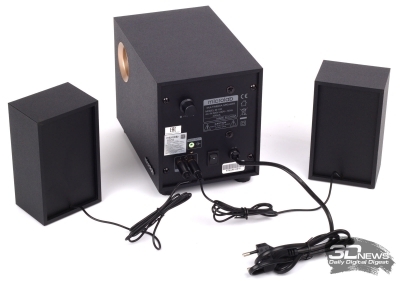 Power low, speakers small, subwoofer is generally tiny and lightweight. But after the first listening attitude to this set completely changed. Of course, one should not expect miracles from such acoustics, but clean, clear bass and rich MIDs make listening even classical music is pleasant. Despite the fact that this kit will certainly be in demand primarily as a computer accessory, the bass here is not bursting forward as a pure game trifonych. He just neatly complements the lack of low frequencies in the columns. 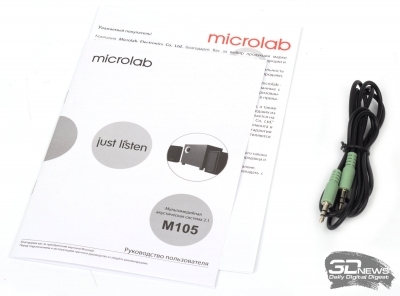 High frequencies are less fortunate: they have Microlab M-105 not as clear and transparent as the average, but all that hears the ear does not cause problems. Noticeable distortions of the sound throughout the volume range. A bit unusual vocal sounds, but no negativity does not cause it. It is easy to guess that the best way Microlab M-105 reveals when playing electronic and pop music. Very bright, without much bass sound colour and jazz compositions. As for volume, according to the manufacturer of 10 W is not so little when it comes to small company to watch a movie or talk about life, including the background some light relaxing music. This power level too much. By the way, for movies and games, model Microlab M-105 fits perfectly. Of course, with this set it is difficult to provide a three-dimensional sound picture, but clear and bright sound of the explosion or shot can make you start. With proper speaker placement can achieve good stereo effect, which also has a positive impact on the perception of the media of the action taking place on screen. Over three decades of stay on audiorant the company Microlab Electronics has accumulated very rich experience of development and production of home audio. This manufacturer can easily afford to experiment, and the acoustic system Microlab M-105 – this is precisely the result of such experiments. I must say, very successful experiment, which appeared modest in price, Spartan in design and very good quality of sound table or shelf acoustics standard 2.1.
very low for a set of standard 2.1 the cost. only one input for audio source. But all the above-mentioned disadvantages do not affect sound quality. They are all dictated by the low cost of the kit, which can be found for less than a thousand rubles. For the money it’s hard to buy even more or less decent speakers, not something that trifonic! 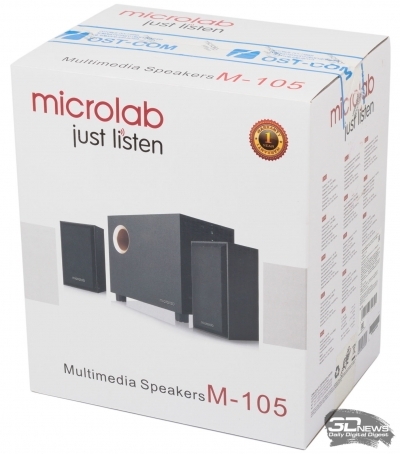 Therefore, we believe that desktop speakers Microlab M-105 has all chances to become the sales leader in its class.